Kevin J. Pearson is a Vice Chairman of M&T. He was elected to this position in January 2014, and to the Board of Directors of M&T and M&T Bank in April 2018. He has responsibility for the Commercial Banking, Credit, Technology and Operations, Wealth and Institutional Divisions. Pearson joined M&T Bank in 1989 as part of the Private Banking Division in New York City and went on to hold a number of management positions, including head of commercial lending in the bank’s Tarrytown region, Philadelphia Regional President and New York City Metro-Area Executive. 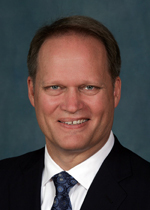 He joined Management Committee and was named Executive Vice President in 2002. He received a Bachelor of Science (BS) in Commerce and a Master of Business Administration (MBA) from Santa Clara University. Upon graduation, he worked for Citicorp Credit Services and Citibank Private Banking. Pearson is a member of the boards of the Regional Plan Association and Greater New York Councils Boy Scouts of America. He also serves as trustee of the boards of Mercy Health Services and The Park School of Baltimore.